Trees, leaves, and flowers were frequently done using applique, but the 9-patch Maple Leaf was one of many patchwork designs based on elements from the natural environment of quilters. Typically made in two strongly contrasting colors, the block is constructed of 2 dark and 3 light squares and 4 half-square triangles. The stem is a strip of the light fabric appliqued diagonally on a light square. 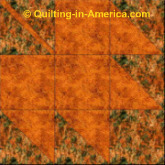 While all seasonal colors were appropriate for the Maple Leaf design, autumn red, oranges, and browns were particularly popular. The pieced blocks were usually joined with plain blocks when creating the top.